If you want a quiet dinner at the Cliff House Hotel just make sure you dont go posting a photo or blog entry using the words "molecular gastronomy" anywhere near Martijn Kajuiter's name beforehand. The Irish Times got away with it but I certainly didnt. This telling off didnt affect my meal too much and I would definitely without any hesitation say that this is the best meal I have ever eaten, of course eating in the company of 18 confirmed foodies is also a big bonus! Rather than call him anything with the words molecular in it I will refer to him as a food magician going forwards as given the quality and taste of his food creations the word chef just seems far too plain of a word for him. He did say that I am allowed say that he smoked a lot in his youth which may partly have influenced his fantastic food creations and pointed out that he was right to defend his honour as "only the paranoid survive". 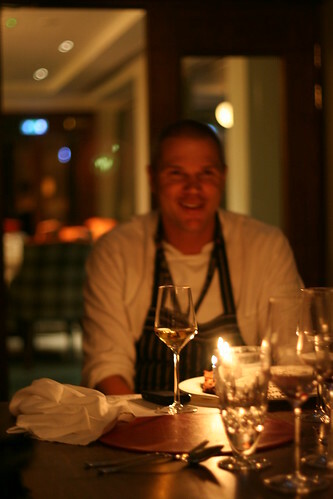 Our night for dinner last week happened to coincide with fabulous weather and Martijns birthday. The Cliff House Hotel in Ardmore sits on a stunning part of the coastline which on that evening felt very like the Mediterranean and I would imagine even when the weather is awful is still a very fabulous place to spend a few days. After a glass or two of prosecco on the terrace we went in for the full 8 course tasting menu which my words are far too inadequate to describe so hopefully the photos and some descriptions will give you an idea. 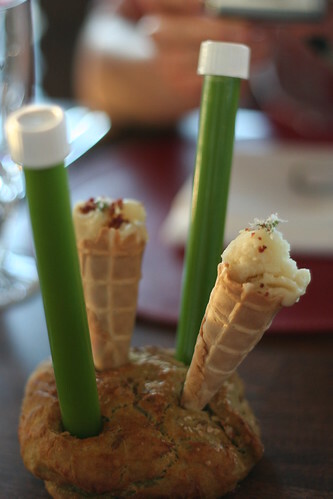 This was a test tube of apple and tarragon gazpacho and a celeriac icecream with ham crumbs and coriander blossom. The bread it was served in wasnt for eating (although we did try). 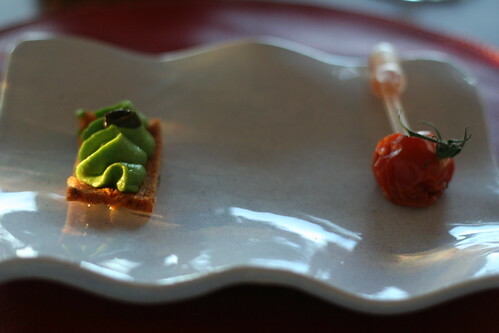 Next a semi-dried cherry tomato with a pipette of tomato juice, gin and celery salt along with a crostini with broccoli puree and a black olive. Some amusement was to be had as to how exactly we were to ingest the pipette. 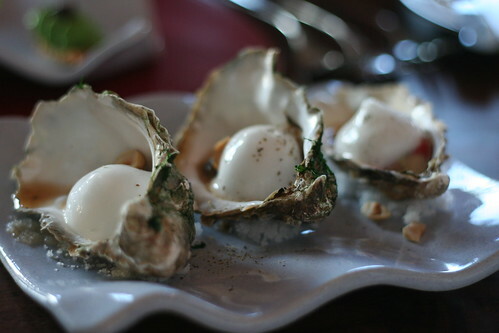 Then onto a Helvic Oyster and Guinness - an oyster meringue with gooseberry and hazelnut. Are you beginning to see why I call him a food magician yet? We are still only on the Amuse Bouche! This came with a lovely glass of Gruner Veltiner. 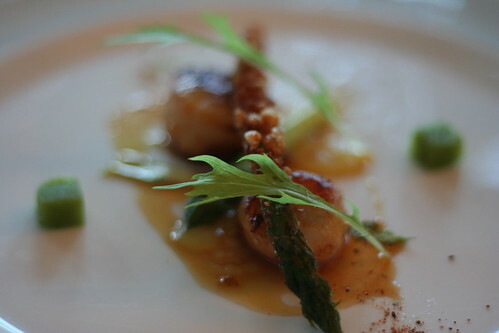 Next we had what was described as West Cork Scallops with Green Asparagus Textures and Mizuna. There were at least 4 textures of asparagus here between the deep fried with a scallop roe popcorn, jelly cubes, powder and raw shavings along with the most perfectly cooked scallops to have ever crossed my lips. 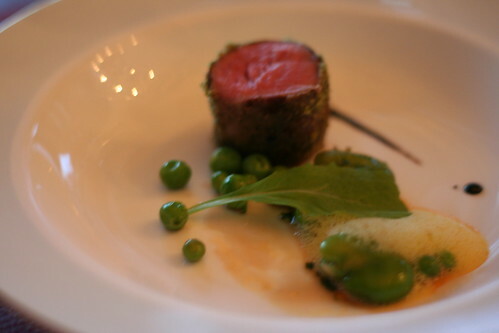 Then we had some "Local Suffolk Lamb with Apple Mint, Broad beans and Verjus 8 Brix". Fresh new peas and broad beans have been my absolute favourite veg over the last few months on an organic farm so this course had me beaming and wondering was everyone else drunk enough yet for me to be allowed lick the plate (the answer was no). From this stage on my photos get a bit blurrier due to it getting a bit darker outside and my hands getting a bit shakier. 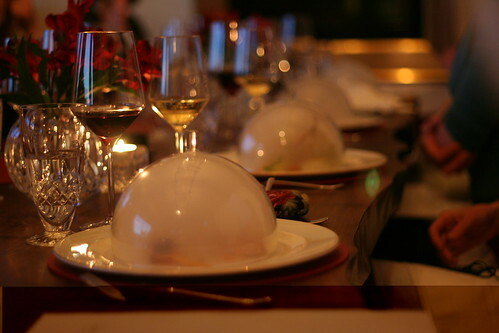 Once the domes were removed there was a rush of smoke (unphotographable at this stage of the night) followed be a view of salmon presented in a number of different ways from a lollipop to an iced mouse and the most perfect eggs which werent eggs at all but salmon juice magically conjured into eggs using a calcium chloride bath. These little eggs had the whole table purring with delight. 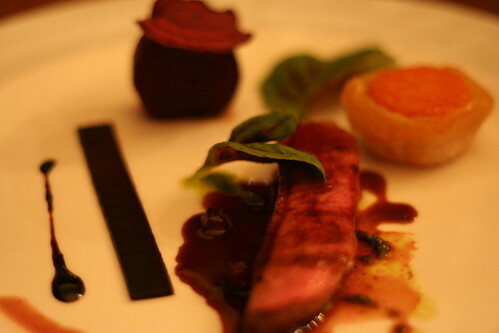 As our final savoury course we had "Skeaghanore Duck with Beetroot, Sweet Potato and Amaranth Spinach". The meat once again was perfect along with the few different types of beetroot -gel, chip and boiled (and how lovely it is to see beetroot on menus when its in season). Surprisingly it was still too early in the night for me to be licking my plate despite the fact that at this stage we were onto Wine number 4 if not further along. 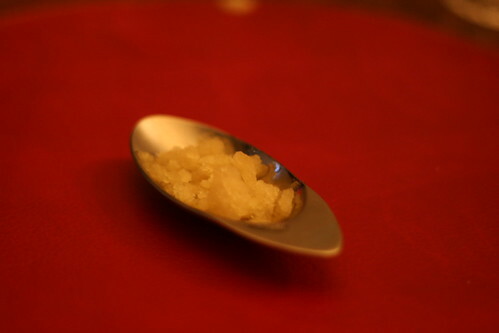 Next onto the Pre Dessert of a Lemon Verbena tea sorbet and a lovely white chocolate with lemon peel and pop rock which was so fantastic that there wasnt one left on the table by the time my camera was at the ready. Should I ever get to chose a last meal then I will have at least a pre-dessert and 2 desserts to follow so these few remaining courses were very much my cup of tea. 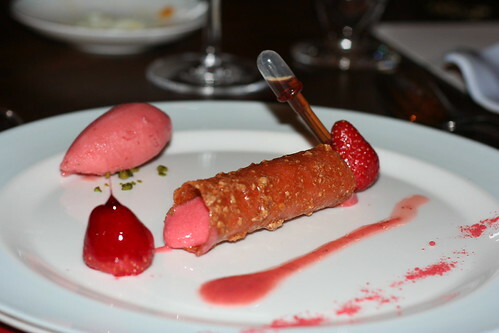 This "Strawberry Collection 2009" comprised of a sorbet, a strawberry dipped in caramel, a coulis, powder, a consomme infused with elderflower, an infusion with verjus and a honey custard made of soya milk (not pictured). To say that Martijn got every possible last bit out of the strawberries is a massive understatement. 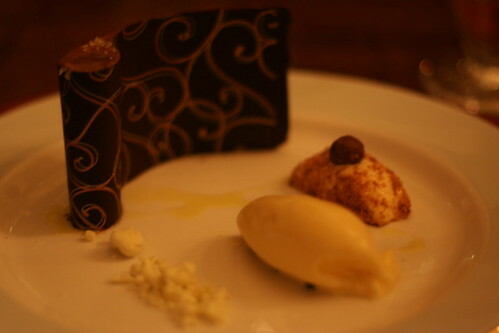 Finally then we had what was described as "Dark Chocolate 70%, Coffee Ice, Olive Oil and Sea Salt" which comprised of a mousse in a chocolate curl, some white coffee ice cream, a white chocolate parfait with a popping mini malteaser and some olive oil dehydrated with tapioca flour. The quality of the local produce (some even sourced from the hotel gardens) and the work that goes into putting this food together is well worth every penny you pay for this menu, even if the service, atmosphere and view were not all as impeccable as they are. Despite the fact that Martijn wont be giving me a job any time soon for my misuse of a certain term I really enjoyed my meal and am looking forward to his forthcoming book and hopefully another trip to visit! PS. Thanks to the lovely Charlotte J who was wise enough to bring a pen and write down some of the descriptions of the foods! Just saw this blog now - didn´t know you had it. Its great! Sounds really interesting what you are doing...am sure there are some Catalan restaurants you have heard of in this same vein...they are quite experimental in some I believe. We tried to get a reservation in El Bulli and in one of Carmen Ruscadella's but so far to no avail. 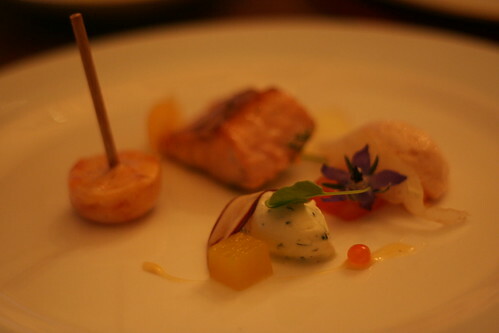 Found this blog through Gastronom.ie great blog about the Cliff House , been there once since it was done up they do fantastic food. Great photos by the way. yep cliodhna, will be calling el bulli every day to see if I can get a cancelation when Im over there in August - one of the girls here had dinner there and said it was absolutely amazing.